Rasta Tuwa (around 60 years old), was accused of being a sorcerer by people from her village after the death of a young man in 2003. During the funeral, attended by all the villagers, the crowd surrounded Rasta and began to beat her severely, strangling her with a rope and wielding axes, bush knives and wooden sticks. Rasta managed to escape and ran into her house, where she was caught by one of the attackers. He tried to cut off Rasta’s head with a bush knife, but she managed to protect herself with her arm, which was immediately chopped off. Rasta managed to survive that day, but had to leave the village for good. Her husband later received 600 kina (300 USD) from the village elders for the damage to his wife. 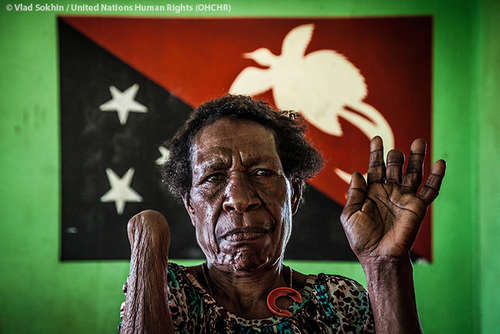 However, Rasta never received the money given to her husband and had to seek help from her relatives in her home village of Kudjip (Jiwaka Province), where she now lives.